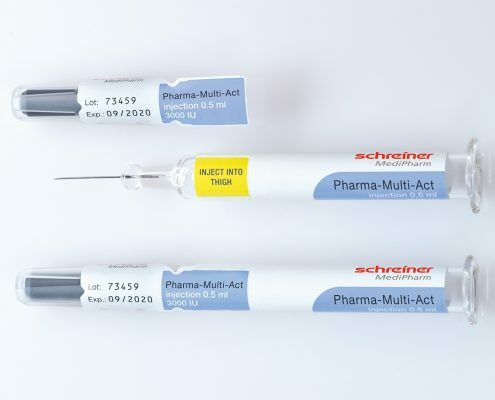 Schreiner MediPharm has developed a novel marking solution for syringes: Pharma-Multi-Act. Labels applied to pharmaceutical packaging have evolved into high-tech products featuring a wide variety of functions. The innovative product solutions presented at interpack in Düsseldorf by our Schreiner MediPharm business unit demonstrate these evolutions. Special highlights showcased by Schreiner MediPharm in Hall 7A (Stand B02) include a brand new marking solution for syringes and smart labels with integrated NFC technology. Syringes require special tamper protection solutions that can be activated quickly and effectively without impairing the injection process. Pharma-Multi-Act, the latest product innovation by Schreiner MediPharm for activating various functions with one flick of the wrist, precisely serves this purpose. 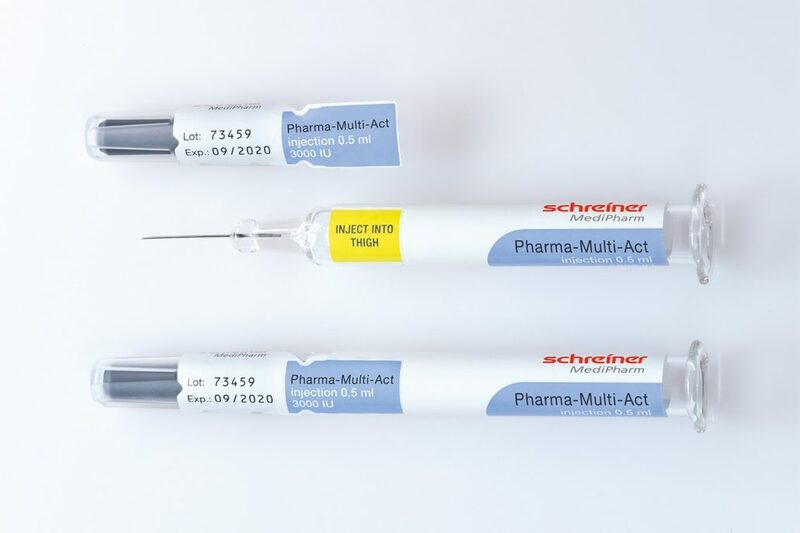 Pharma-Multi-Act has a unique feature: a label-integrated perforated tab that ends on the syringe cap. When opening the cap, the marking label’s first-opening indication is automatically triggered along the perforation. As a result, the label and the container are opened at the same time with a single flick of the wrist, without requiring another step to remove the seal. Another highlight of the product lineup for syringes featured at Schreiner MediPharm’s booth is the live demonstration of a semi-automatic dispensing system. It demonstrates how easily the Needle-Trap protection system can be applied to prefilled syringes – this has already happened millions of times. A plastic needle trap is an integral component of the label and serves to secure the needle after the injection. Self-medication, and thus maximum ease of use, has gained increasing importance as well. Digital technologies such as Near Field Communication (NFC) or Radio Frequency Identification (RFID) assist patients in self-administering medicines. At the interpack booth, our experts from Schreiner MediPharm explain how NFC/RFID technology can be integrated into a label and various added value and application options these smart labels offer to patients and manufacturers.